I was looking forward to write a Redington Skagits review, since they are my standard wading shoes for fly fishing. I used them already for a whole season and they still serve me well while walking through water, mud, over slippery stones and everything that you can find around or in a river or lake. If you want to know why I like them so much, keep on reading this review. If you wear stockingfoot waders you won’t get around getting a pair of wading boots. There are several reasons why this should be a proper pair. One of them is safety. If you walk through streams and rivers the stones are slippery and without enough traction, you will fall and in a worst case scenario die. I do not exaggerate here and therefore recommend, if there is one piece of gear that you spend a bit more money on, it should be wading boots. The Redington Skagit are made out of synthetic fabrics. A really important feature of wading boots is a properly working drainage system. Water will enter your shoes and when you leave the river, to walk to the next spot, you also want it to leave said shoe again. As fast as possible. Keeping that in mind Redington used nylon and synthetic leather for the upper part. This provides breathability and ensures that entered water drains quickly. The combination also makes sure that the boots are durable and remain flexible over time. Thanks to that they are also pleasantly light. All around the lower part of the boot is an extra layer of rubber with an extra piece for the heels. This is meant to boost durability and abrasion resistance. For the sole, you have two options, the sticky rubber or felt soles. I chose the sticky rubber version since I tend to also walk a lot next to the river to get to different fishing spots. If you do this with felt soles they will wear down in no time. A little extra feature is crushed walnut shells implemented in the soles, which are meant to improve traction. To be honest I can not really tell if they make a difference… sounds cool though. What you also have is the opportunity to add Studs which you can purchase separately. Little holes in the sole make it possible to screw in spikes that will give you extra traction. The process to attach and detach them is easy and I like to use them in streams with rotten leaves in, which are particularly slippery. Who ever used wading boots with studs before, knows the huge difference they can make. As all wading boots, the Redington Skagit are slightly larger than you would expect from a certain size. This ensures that you can fit your neoprene booties in. That being said, if this is not your first pair, I should mention that although they are slightly oversized, they are not nearly as oversized as it is usually the case. I wear only a half size bigger than my everyday shoes are. As stated earlier I use them regularly. If you ever wore felt soles in a river you know how remarkable the traction is. If you take long walks with them though they are not really practical, so I always wore rubber soles. The first time I entered the river with the Redington Skagit, I was surprised how close their rubber soles actually come to felt in terms of traction. The rubber gets soft and the resulting grip is amazing. Once again, no idea if the walnut shells help here, but anyway, it’s the result that counts. Once out of the stream, the water drains fast. Faster than out of every other boot I had so far. The synthetic fabrics used here do not soak up with water which is often the case with cheap wading boots. Therefore the weight goes back to normal really quickly and you can enjoy your 3.5lb shoes. 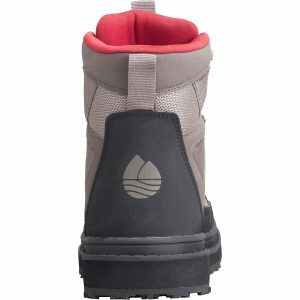 Light wading boots are comfortable wading boots. Having clumpy heavy gear on your feet will exhaust you fast resulting in less energy for the important stuff: fishing! The ankle and heel support is decent enough to give you a save standing in the river. Since sprains and rolled ankles are the most common injuries while fly fishing, ankle and heel support is something you should look for. Both is definetly provided here, making them a great choice, even for fast flowing rivers and streams. I hope it came across, why these are one my favourite pairs only second to the Simms G3 Guide Boots. 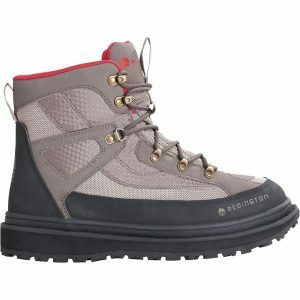 The Redington Skagit are definitely worth the money and as being said earlier, there’s one item you “bite the bullet” and spent a little more on, it should be wading boots. You will definitely not regret buying them and that is why you will also find them in our best wading boots ranking.